As we all know putting is a very important part of the golf game. But it doesn't get nearly as much time as the actual golf swing when we are practicing. Putting is a reflection of individualism. There are as many different forms of putting strokes as there are styles of putters But the basic fundamentals remain the same. Creating a routine with basic fundamentals will help in the execution of a putting stroke that should work for you. A. Read the contours of the green. B. Think about distance of the putt. D. Align yourself, the head of your putter, and the name of your ball to your target. 1. Grip the putter as if you are holding a soft-boiled egg. 2. Your stance should be about a foot apart with the weight equally distributed. 3. Point your knees in towards each other slightly. 4. Bend from your waist and allow your shoulders, arms, and hands to work together as one unit. 5. Keep your head as motionless as possible and keep your lower body stationary. 6. In the putting stroke, the follow through should be the same distance as your back stroke with the putter head low to the ground keeping the tempo steady. "The USGA definition of a Putting Green is all ground of the hole being played which is specially prepared for putting or otherwise defined as such by the Committee. A ball is on the putting green when any part of it touches the green." Even the gentlest of putts has the club head forming an arc during the stroke. In a practice putt, be ready to feel for any contact with the green. Practice putt until such contact is felt. 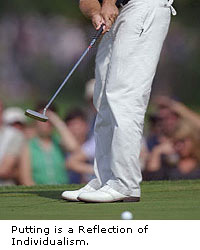 Then ,with hands in the same position on the club grip, return the putter head to the point in the stroke that contact with the green was made. Hold the club head against the green and slacken your grip. Slide your hands down the grip until a comfortable stance is achieved (could be a matter of millimetres!). Now replay a practice putt and feel how much smoother the swing feels. And..Please, lets keep our heads down. (Anyway, Its much more pleasant to hear the ball drop). Visually following the ball's path usually causes a push to the right. 1/ To read the line one has to walk right around the hole from some distance, keeping one's eye level as low as possible. 3/ It is important to grip the putter as lightly as possible ( almost till it slips out of your hands). 4/ Forward stroke should be at least as much as the backswing, (and even more on longer putts). 5/ Elbows should maintain their angle throughout the swing, and the entire movement should be prompted by the shoulders. 6/ Grip and eyeballs should be absolutely vertical to the ball and perpendicular to the visualised line. 7/ The visualised line should be as wide as the diameter of the hole. 8/ BELIEVE IN YOURSELF and BE CONFIDENT that the ball can only end up in the cup. The putt is yours! how did you play putting? I believe my speed is good. However my green reading needs improvement. Instruction varies widely on the best approach to reading greens. It causing me to 2nd guess when addressing. I don't expect to make every putt but the path I pick should offer some threat to the hole on a consistant basis. I'm looking for what works for me. Can you offer any training tips or logic in my search? line. Hope you understand my point. or maybe lifting the shoulder??? Hover the putter off the ground before u stroke it.